Public Health Wales has reported an outbreak of almost 190 reported cases of measles in South Wales since November 2012. They are focusing their investigation in Swansea and Neath Port Talbot, where 189 cases have been confirmed. Cases have been notified in 32 secondary and primary schools and nurseries across the area, with 20 cases notified in the last week alone. 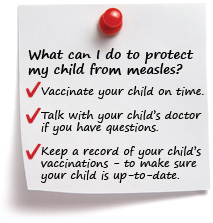 The only protection against measles is the MMR vaccination. There are no other methods to protect a child from measles, other than isolation in a bubble against an outbreak. And despite the fraudulent claims of Mr. Andrew Wakefield and his acolytes, minions, and disciples, the MMR vaccine is safe and effective. And it does not cause autism. Measles is just so contagious, that one unvaccinated child with the infection can pass it to nearly anyone that lacks immunity to the disease. An infected child can walk into a pediatrician’s office, where there may be infants who are too young for the vaccination, and pass it to them. Measles is not just a simple disease with a few red spots on your skin. It can lead to more serious complications like encephalitis and corneal scarring. In fact, complications are more frequent and severe in older teenagers and young adults (even if healthy), so the need for vaccination has significant benefits even if you’re an adult. Many children are unvaccinated in South Wales. Maybe it’s because they believe the false information promoted by Wakefield and other vaccine deniers. Maybe they forgot to update or complete the vaccination series. Maybe they can’t afford the vaccine (though I don’t think that’s an issue in the UK’s public health system.) It’s the lack of immunized children that have caused this outbreak. Hopefully, parents will see the scientific truth and protect their children.